Queues for good times, queues for serious business—queues for queues, and queues to find out which queue you should be queuing in and which you should not. Berlin may be the modern land of milk and honey, but you’d better be prepared to wait in an orderly line for your share of the good stuff. There may be eternal controversy over when exactly it started, how long it lasted, or if it’s even over, but most people are liable to at least agree on the existence of a moment in time when Berlin became a kind of promised land. The buzzword of global travel, the international hub for young artists and creatives, the It Girl of capital cities—everyone wants to get heavily involved. One facet of the Promised Land considerably less touted, however, is the queues. Queues, queues, queues. Queues for good times, queues for serious business—queues for queues, and queues to find out which queue you should be queuing in and which you should not (this may sound hyperbolic if you’re not used to such ardent queuing culture but believe me, it’s a thing—I’ve seen it unfold right before my eyes). Berlin may be the modern land of milk and honey, but you’d better be prepared to wait in an orderly line for your share of the good stuff. Whether it’s waiting three minutes for the ATM every time you need cash, or waiting three hours to get your address registered at the Bürgeramt, there's a queue near you that’s waiting for your patience. 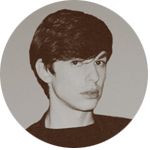 And if you think three hours is a rude wait, many Berliners are willing to wait longer still to get into Berghain, often only to discover they’ve really been queuing all this time to receive a grave shake of the head and a dismissive wave. It’s no wonder that Schlange, the German word for queue—literally meaning ‘snake’—is usually one of the first German words to slip into an expat’s vocabulary. And there are all kinds of queues to queue in. There are the many literal queues, like when you go to Lidl at the wrong time of day and join fifty other disgruntled customers waiting to be served by just two cashiers; and there are the metaphorical ones, like waiting your turn to be taken seriously as a Berlin settler instead of being dismissed as just another bothersome tourist crowding up the place. In other words, you have to symbolically wait your turn to claim your privilege of literally waiting your turn. 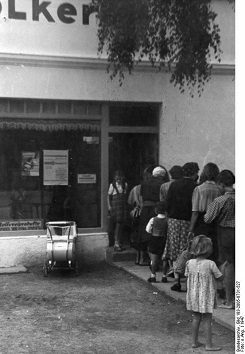 Queue in front of a grocery store | © Bundesarchiv, Bild 183-2005-0731-527 / CC-BY-SA 3.0 And let’s not forget the officially ticketed queues, where you press a little button on a machine and take your number on a slip of paper. This variety is typically found in governmental service settings like the Ausländerbehörde, where you nervously await your visa fate, or at the BVG’s customer centre, where you go to dispute a train fine. By far the most comical application of this scheme I’ve come across is at a popular Berlin hairdressing chain: you arrive, press a little button, and become just another number in the tyrannical system of fashion—that’s some next-level love for the queue right there. Now of course one could surmise this is all just the logical consequence of a city continually inundated with new entrants. Indeed, one could well argue it’s actually myself and all the others like me who are the very reason for all this tedious queuing. But aside from this obvious factor, German culture does seem to have something of a soft spot for the grand order of the queue. Truly, many people here seem to enjoy nothing more than getting out of the house for a good old-fashioned standing session in a long, slowly moving line. Just the other evening I ducked out to pick up a package from my local post outlet to find a big, nasty queue twisting out of the store and onto the street. Naturally, I turned right back around and headed home to the cosiness of my flat, deciding to come back at a less crowded, more convenient time. And the queuers? To the best of my knowledge they continued to stand there in the freezing dark street, obediently waiting their turn and soaking up the queue vibes. It was as if they had simply arrived at the most natural place to be at that point in their nights. Legend has it some are still queuing there now.